I made a dish similar to this last month, but today I substituted zucchini and eggplant for the marinated lamb. I’m grilling the veggies on a grill pan; I’ve sacrificed one to many slices of vegetables this year to the God of the Flames. You will have leftover tzadziki, but it keeps in your fridge several days. It’s a healthy veggie dip and wonderful spread over grilled salmon or chicken. Arrange zucchini and eggplant on grill pan or directly on grill grates. Brushing with olive oil, grill 10-15 minutes on each side or until tender and easilty pricked with a fork. 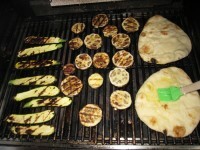 When vegetables are almost ready, brush both sides of flatbread with olive oil and grill about 1-2 minutes per side. 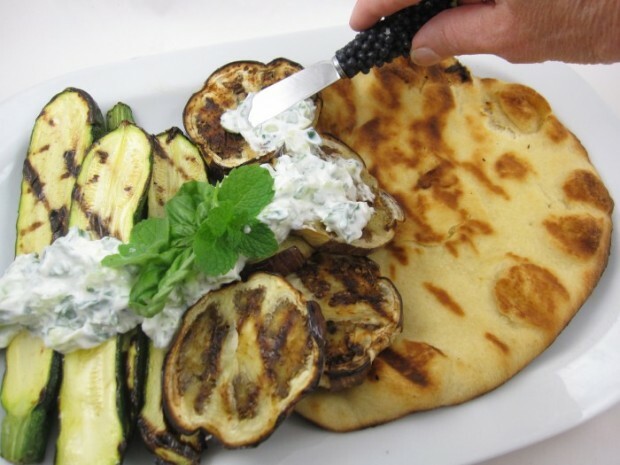 Spread tzadziki over flatbread or over vegetables placed on flatbread and serve. Place diced cucumbers on paper towels or in a fine mesh sieve; lightly sprinkle with kosher salt. Let drain 15-30 minutes, pressing into towels or sieve with spoon to release excess moisture. To make the tzadziki, combine cucumbers with herbs, garlic and yogurt; season to taste with kosher salt, if needed, and freshly ground pepper. Refrigerate until ready to use.